XS Energy Drink is manufactured by California-based company Logic Nutrition, but the product is exclusively distributed and sold by Quixtar, a multi-level marketing company. XS emphasizes that it has "0 Carbs, 0 Sugar and only 8 Calories" and offers more flavors than most other brands, including three that are also available in caffeine-free versions. The drink contains no carbohydrate, and claims only eight calories with B vitamins and a variety of adaptogenic herbs (natural herb products that increase the body's resistance to stresses such as trauma, anxiety and bodily fatigue and that help the body maintain optimal homeostasis). 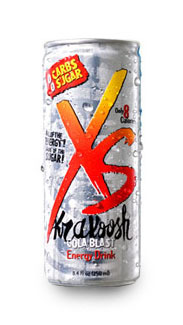 The XSGear website includes recipes for mixed drinks and smoothies made with XS Energy drinks, as well as apparel, accessories and other promotional gear (e.g. glowing shot glasses, mini coolers, stickers, pens) for OTC marketing campaigns.